Sherlock is back to help with your Spring Kitchen Clean-Out. Make it fun, make it easy, do it in stages or do it all at once. I’ll paraphrase Ray and Tom on NPR Car Talk – “Well you’ve wasted another good winter on the couch when you could have been cleaning out your kitchen.” But wait, it’s not too late! It doesn’t matter when you get started, what matters to you feeling good and calming your digestion, is that you start! How do you handle the change in the kitchen? Most people will find it easiest to do this in phases especially if you have a family. Singles may find it easier to take the Nike approach and “just do it” all at once. And every decade or so, if you don’t do it yearly it needs to be done again as foods may creep back in. It’s also a great opportunity to read the ingredient lists as manufacturers change the ingredients. I’m reminded of a small coconut cookie that I use to love that contained coconut, egg whites and honey (a macaroon). The 2 bite cookie was a delicious treat and great for a food boost while traveling if a meal was delayed. Then I noticed the label had changed (a Sherlock clue to re-read the ingredients). I immediately read the ingredients and yes the honey was gone and white sugar and a bunch of other unnecessary ingredients were added. Why? The small company had been purchased by a big food corporation and changed a perfectly great product into one that I never buy now. 1. How much refined food products are in the ingredient list? 2. How many unrecognizable ingredients are there? 3. How will my digestion feel when I eat this food? Fewer ingredients = better digestion. 4. If you were making the same product in your kitchen how does the recipe compare to the ingredient list? I digress, back to spring cleaning the kitchen. Start with the refrigerator and freezer. Remove all “science experiments” and jarred food that you don’t know how old it is. The golden rule of food is: “When in doubt, dump it out!” Clean the refrigerator and freezer and then go shopping. First make a shopping list of new food staples, which will vary for each depending on your starting point. Think fresh, think perishable. Next clean out the food pantry or cupboards. Same process and oh the treasures you will find! Check the expiration dates. Unopened products can be donated to your local food bank or charity that accepts dry food and canned donations. Clean the cupboard, make a new staples shopping list with foods you want to eat and go shopping. 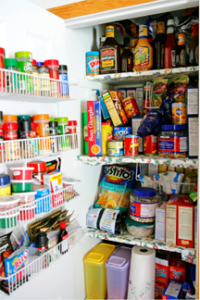 You may find sudden emptiness in your pantry as processed foods decrease or are eliminated, and fresh food becomes the new normal. Start with cereal, ramen, chips, cookies, candy, other packaged desserts and dried fruits with added sugar. Replace them with oatmeal, whole grains, fruits and vegetables. When you are replacing staples look for products that are unsweetened by reading the ingredient list. Sugar free will mean that a sugar substitute has been used, anything from aspartame to stevia. Write a shopping list that will work for your transition, all at once or in increments. I can tell you from experience that it’s great to type it up so you can see how you’ve changed your eating year to year. Products change, you change, what you purchase changes. Great, you’re still with me! Fill in your name and email address here and you’ll receive the Blog and The FOOD STEP newsletter in your email in-box. email: info@foodnyou.com or call: 505-438-2886 (outside USA dial: 011-1-505-438-2886). Yup, our kitchens get filled up even with good stuff, but things get shoved to the back of the fridge, freezer or pantry, cupboard, and suddenly ooh what is that leaking, or odd smell or geez! I have had this thing this long? Yikes. Thanks for the guide and inspiration to clean it out. I usually do my fridge once a week as I peruse what I need foodwise, then I can dump leftovers that are close to lab experiment or bacteria jungle before they explode! It is easy to forget staple items like flour, sugar, baking powder or soda, cooking oils that if not used regularly can spoil or go stale. I now mark all my bags or bottles with a date so at a glance I don’t have to do the sniff-it or taste it test. It helps since in my house food needs and tastes change so quickly, two months ago everyone liked a certain pasta or grain, or product, now no one does. If still good then give it to a food pantry for the needy or toss it. Thanks Carole. Once a week clean out – Chris, that’s awesome! Our thinking about doing it takes longer than the actual doing it! I’m great at procrastinating what I see needs to be done and doing it, yet it feels so much better to just do it! Marking with dates is required in institution kitchens and a fabulous practice for the home kitchen as well. I find too that products change especially the ones I really like, and like you said what we eat changes and needs to change with the season and our physical needs each day, each year, each decade. Thanks for sharing your insights.